Today, you hear of horrifying stories about fires due to faulty electrical outlets and wirings, short or circuit overload, and the like. We certainly do not want this to happen in our homes and offices, and to do that, hiring licensed electricians will be one of the best ways to avoid these things from happening. Not all of us are skilled enough to take care of electrical problems when they arise, and even we are knowledgeable and skilled, we should consider the risks that may happen if we don’t contact licensed electricians. Every home or establishment needs the right or suitable electrical system depending on the need of the building to ensure that proper usage of appliances and other electrical devices. 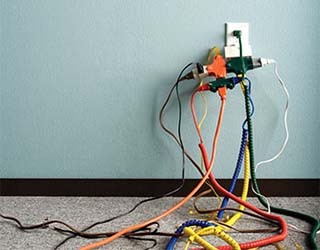 If any part of this electrical system fails, then you may experience minor and even major problems like fire. Hence, hiring a professional and licensed electrician is one step from avoiding life-threatening problems from arising while ensuring you peace of mind. Licensed by the government. Since this person has been certified and licensed, this means he/she has taken the necessary steps to be granted such license by the government agency to perform different electrical-related job. At the same time, when a licensed electrician faces problems related to his/her job, he/she knows how to handle it as he/she was trained to do so. Needless to say, before he/she was allowed to take the licensure examination, he/she has studied and trained for months to years in order to qualify for the examination. And thanks to their license, clients are assured that they are getting at least the minimum level of work quality and safety set by the law of the state or country. Excellent quality of work.When you hire a licensed electrician, you would have lesser worries about the quality of work they render. Since they were taught and trained in the proper installation of the electrical system and how to handle when problems arise, you are assured that they will handle the job excellently. Plus, they have to keep up with the standards brought about by their license. One time payment for services rendered. At first you decide to do the job because you think you have sufficient knowledge to handle electrical-related situations, or perhaps you hire an unlicensed electrician, and later on a problem arises. This will compel you to hire a licensed electrician, which will again cost you a lot. Aside from this, you have to spend for the materials needed to fix the electrical problem that took place. You certainly don’t want to spend twice right? Insurance companies cover the expenses. If your home is insured, the insurance coverage will include the costs of home maintenance or repairs. However, insurance companies will only cover the expenses if you hire licensed professionals like licensed electricians. This will surely cut off your possible expenses. They’re reliable. As professionals, most of the licensed electricians today’s are reliable especially when doing their job. Because of their skills, knowledge, and past experiences, they know how to handle job-related problems. You have certainly nothing to lose if you hire a licensed electrician. A lot of homeowners can attest to that as they have more positive experiences when they hired licensed electricians to handle electric-related problems.